You can enter to win passes for two plus a download to get the soundtrack of the new movie, Ex Machina. Domhnall Gleeson stars in the movie as a programmer who is tasked with evaluating his company CEO’s (Oscar Isaac) experiment in artificial intelligence (Alicia Vikander). What was supposed to be a routine check turns into much more as reality comes into question, as well as who is the one being tested—man or machine. The movie releases in Toronto and Vancouver on April 24 and in Calgary, Edmonton, Winnipeg, Halifax, Victoria and Ottawa on May 8, 2015. If you live in any of these cities (or near enough to attend a movie in one of them) and would like a run of engagement pass for two (valid Monday to Thursday as long as the movie is showing) and a digital download of the soundtrack, let us know by commenting below to tell us which city you want to see it in. Winners for Toronto, Vancouver and Edmonton: Steve Thorne, Bob Dack, Corinne Wegener-Pehrson, Caleb Chadwick, Dave Cleary, Liette Leclair, Alayne Langford, Angelene Ashawesega, Kevin Rambally, Sam Aspro, Marty November, Lyndie Lee, Kevin Castillo, Greg Leong, Louise Allen. Winners for the other cities (Calgary, Winnipeg, Halifax, Victoria and Ottawa) will be chosen and contacted by Friday, May 1. This looks like an awesome movie, and if I can see it in EDMONTON, that would be awesome. 2 passes for Toronto, please. Thank you. i would love to see it in TORONTO please! I’d love to get passes for Edmonton Alberta Please! TORONTO please! The trailer startles me, would love to see! Got a great review in the LA Times. Two for Vancouver. Thanks. Winnipeg! AI movies are awesome! Toronto…..please and thank you so much. Would like to see the film in Vancouver please! Wow, saw the trailer and now am dying to see it. I’d love to win tickets for 2 for winnipeg. Toronto. All these actors are one’s to watch. Toronto, thanks. Looks so good. Montreal, please. Thank you in advance. I’d like to see it in Ottawa. I live in the Toronto area and have been excitedly waiting too see this movie! I would so very much enjoy the passes and the download too. 2 passes for halifax please 🙂 thank you! I would like to see EX MACHINA in Toronto. Edmonton, I would like to see this in. Me please! pretty please yes? The movie looks great!! I would love to see it in Toronto. Want to see this so much! Toronto. WOW! Looks quite interesting. Victoria, BC please. And Thank You very much. Hi – I would like to win for the Vancouver market. Thank you. Victoria, please. Saw the trailer for this last night and would love to see it. Looks interesting! I’d love to see it in Edmonton please. Vancouver,B.C. please. Thanks for the opportunity! Ottawa would be fantastic. Looks great! This film looks awesome, count me in for Calgary! Toronto please! Movie looks amazing. Winnipeg please and thank you! Would love to see this in Vancouver. Wendy W wants Winnipeg. Thanks! I love science fiction/thrillers and would love to see this in Toronto. Halifax is ready for AI. Ottawa is really looking forward to this film! I’d like to see this in Edmonton. Thanks! Hey. I N-E-V-E-R go to the movies but when I heard about this movie I said to my partner, “We have to go to that!” I looked at the trailers online and got really excited. So-o-o-o we booked a date for May 8th, the day the Ex Machina site says that the movie opens in Victoria. And guess what, i just cannot believe it but I’m actually now thinking I might not get to go to the only movie I have wanted to see in ages. I went to The Imitation Game at New Years, because my 22 year-old son wanted to see it. Very good movie. 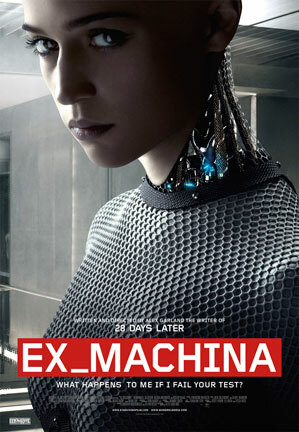 Just cannot believe that this movie, (Ex Machina) is not main stream and going to be everywhere. Please bring it to Victoria. Please, please, please. Yah, me again. PLease please bring this movie to Victoria. Really want to see it. Would take both my sons, 20 and 22, my good friend Richard who shares my love for sci-fi and my partner. If you love sci-fi and action, you’ll love this week’s new DVD/Blu-ray release! Check out Natalie Portman and Oscar Isaac in their film, Annihilation.